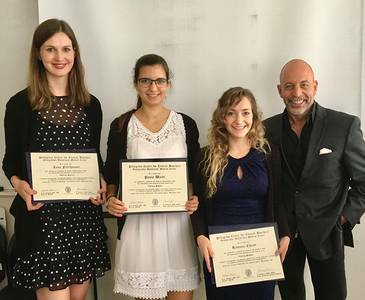 The students Lena Faltlhauser, Paula Waibl and Ramona Christ with Prof. Dr. James Giordano (left to right). The Pellegrino Center for Clinical Bioethics of the Georgetown University hosted three Visiting Scholars from the Division of Integrative Health Promotion at the Coburg University of Applied Sciences in Coburg, Germany. The scholars, Ramona Christ, Lena Faltlhauser and Paula Waibl, presented the results of their research projects completed during their time working under the guidance of Dr. James Giordano, Chief of the Neuroethics Studies Program and Professor in the Departments of Neurology and Biochemistry. Ramona Christ spoke about Medical Cannabis for treating chronic pain and the opportunities, perspectives and ethical responsibilities about this field. Technical and ethical issues at Neurofeedback training after stroke were discussed by Lena Faltlhauser. And Paula Waibl spoke about ethical issues in psychedelic drug research and clinical use.